Frederic Edwin Church (1826-1900) was probably the most renowned American artist of the Civil War era. 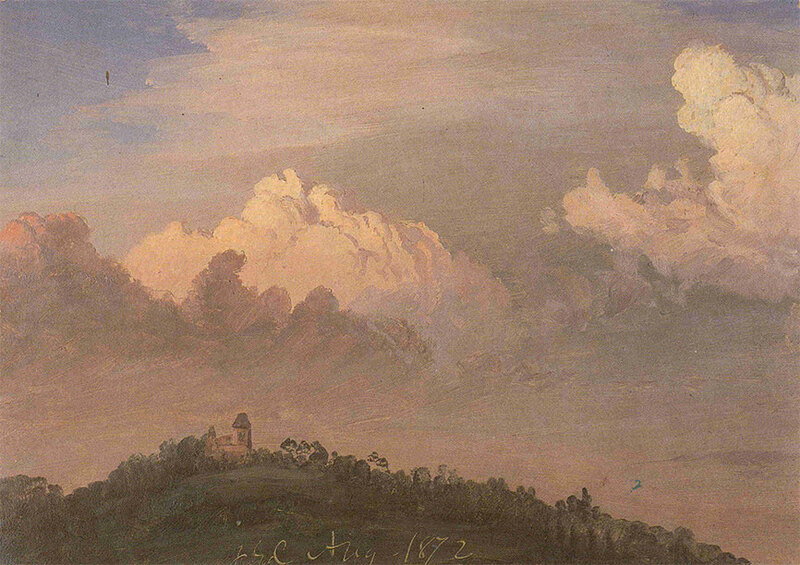 Trained by Thomas Cole, the founder of the Hudson River School of landscape painters, and stimulated by the writings of the famed explorer and naturalist Alexander von Humboldt, Church early demonstrated immense talent and global curiosity. He traveled extensively, and in his New York City studio painted monumental pictures of subjects in North and South America, the sub-Arctic, Europe, and the Near East. From the late 1850s to the 1870s, he displayed his most ambitious canvases as quasi-theatrical events, drawing thousands of people in America and Great Britain to his exhibitions, and marketing many of his works in fine engravings and lithographs. Church amassed wealth sufficient to design and build a large estate, called Olana, in upstate New York for himself and his family, and his prominence was such that in 1870 he was both elected a founding trustee of The Metropolitan Museum of Art and appointed to the Board of the New York City Parks Commission. Though his reputation subsequently faded, Church and his art enjoyed an enthusiastic revival in the second half of the twentieth century. His works now enhance the collections of museums throughout the United States and in Europe, and have been the subject of many exhibitions. As striking in their way as any of Church’s major paintings are his small oil studies and sketches, many executed wholly or partly in the field and several in the studio as designs for the major works. During his residence at Olana, Church framed many of those pictures, including a few large paintings, expressly for presentation in his home, and over a hundred others remain preserved there. Treasures from Olana represents a small selection of the finest of Church’s sketches and studies from the house—most of them he is known to have displayed on its walls—as well as Olana’s most important large painting, El Khasné, Petra. In 1875 he made El Khasné a gift to his wife, Isabel, and installed it over the fireplace in the Sitting Room. See the Treasures exhibition on Facebook, click here. Olana organized this traveling exhibition of Olana’s masterpieces which toured 6 venues from June 2005 through June 2007.